Our EMV card readers offer you more ways to get paid. Accept more payment methods and help reduce your liability for fraud with our EMV chip card readers and the PayPal Here app. Accept major credit and debit cards in person or on-the-go, send invoices and record cash and check transactions. Choose the reader that's right for you. 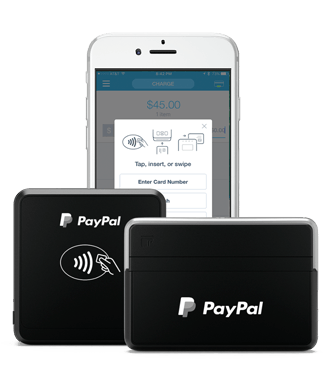 Purchase a PayPal card reader and accept quick, secure payments on-the-go. Apple Pay is a trademark of Apple Inc., registered in the U.S. and other countries. Samsung Pay is a registered trademark of Samsung Electronics Co., Ltd.
Visit our web store to order a reader. Explore the PayPal Here resource center. Find the tools you need to help you manage and grow your business with PayPal Here. One app, many ways to get paid. Accept more payment types, issue receipts, manually enter card payments, track cash and more all from the PayPal Here app. Learn how to set up or update your business profile, add a logo, set up staff, add items to your inventory, preview your receipts and more. Use PayPal Here to run reports, summarizing your sales transactions by date, user, payment type, or item. You can also email yourself a copy of the report. Learn more about our card readers, compatible devices, troubleshooting and more when you visit the PayPal Here resource center. Visit the PayPal Here resource center. SIgn up and download the app today so you can get paid wherever your business takes you.